Garrett Sea Hunter Mark II – Check out the Garrett Sea Hunter Mark II metal detectors cheap and affordably prices for all beachcombers! Ideal for Beaches, Lakes, Oceans, and all Waterways.Sea Hunter has been The Master of Water Treasure Hunting for over 25 years. 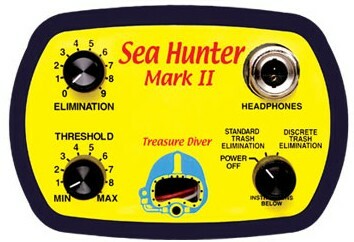 With it’s unique Discrete Trash Elimination technology, the Sea Hunter Mark II can eliminate most pull tabs and foil without significantly degrading the sensitivity of rings and coins in Discrete Elimination mode. A favorite detector for treasure hunters around the world because of it’s ability to ignore salt water, the Sea Hunter’s electronic housing can be mounted on the hip or above, below or under the cuff in either short or long configuration. Discrete Trash Elimination: used to eliminate most pull tabs and foil without significantly degrading sensitivity for rings and coins. Standard Trash Elimination: provides the deepest possible detection – allows a very slow searchcoil sweep in areas with little trash. March 29, 2014 Well this detector works well, I learned it is for wet salt or wet sand beaches. The salt water is where it gets great depth. I leave disc at 0 and never use discreet elim. I dug a deep whisper and found a dime at 2 to 3 scoops! I was using the 8 inch coil, its a bit easier to retrieve targets than my 14 inch coil. By the way I dug near rocks at the waters edge so most of the light sand was gone! I gave it 4 out of 5 stars because I don’t like the wavering threshold when I swing left. Overall Rating 4 stars Durability 5 stars! Ease of Use 5 stars! n spite of the weather and us old fogs being retired, we continue using our seahunters. Yes we have others yet there is no easier P.I. to use far as we are concerned. Those boys in Maine KNOW what they are dong so ten to one once all is warm etc their way they will be posting a lot of finds we wish them all the best. California beaches are a mini gold/silver mine so to speak. A. k. a. mini jewelery store as well.. however do NOT forget the good old high desert areas as well, one may be surprised at what lies beneath her/his own feet. ONE important item, take gentle care of your seahunter, clean it, cover pad it and it will last 4ever! Well we have a lot to get ready for the upcoming season, so all find the best and never say no, remember it is NOT the machine but the one holding it that MUST stay in practice. I have been treasure hunting for more than 37 years and while I am always willing to hunt for all types of lost valuables, my favorite form of treasure hunting is water hunting. The thrill of seeing the glint of a gold ring or old silver coin in the bottom of my scoop has not waned since I first ventured into the water with a detector in the early 1970s. One of the first underwater detectors I used years ago was the original Sea Hunter from Garrett Metal Detectors. With that unit and subsequent Sea Hunters both pulse induction and VLF/TR models I recovered countless coins and pieces of jewelry from sites around the world. So, when I heard that Garrett was sending me one of their new Sea Hunters to test, I was anxious to see what changes had been made to an already proven design. The new Sea Hunter Mark II utilizes pulse induction circuitry which is unaffected by salt water or black sand. Pulse induction of PI units have been used by beach and water hunters searching for treasure in salt water environs for years due to their above-average performance in these conditions. Garretts engineers took the proven Sea Hunter and enhanced it by adding new features and incorporating state-of-the-art microprocessor technology. The one complaint even the most avid PI users voice is the lack of discrimination found on the typical PI detector. While some iron elimination or identification has been found on other PI units, trash such as pull tabs, foil and screw caps must still be recovered. The Mark II has a new discrimination circuit which is similar to that found on conventional VLF units. This circuit called Discrete Trash Elimination allows specific unwanted non-ferrous targets to be effectively rejected while still detecting valuables such as coins, artifacts and gold jewelry. There are two distinct search modes on the Mark II Standard Trash Elimination and Discrete Trash Elimination. The Standard mode is similar to other PI detectors and produces a constant audio threshold that changes when the coil passes over a buried target. The Elimination (discrimination) control is available in this mode as well; however, as the control is turned clockwise, not only are certain targets rejected depending on the setting but the detection depth for all targets is reduced up to 50 percent at the highest setting. The Discrete mode produces a response very similar to that of a conventional VLF-type detector. The coil must be in motion albeit very slightly for a target to produce an audio response. However, use of the Elimination control in this mode allows you to precisely select a specific range of targets to reject without a loss of detection depth. The 8-inch searchcoil on the Sea Hunter Mark II provides good coverage with each sweep and ease of pinpointing detected targets. The factory indicated that the possibility of an optional coil was being explored. The Mark II is waterproof to 200 feet including the control housing and the headphones which come with the unit. The new shaft design allows the detector to be used for wading or diving with a few simple adjustments. It also comes with a nylon pouch to hipmount the control housing if one wants to reduce the weight of the shaft assembly when using it in the wading configuration. Unlike its predecessors which used a nicad pack sealed inside the control housing, the Mark II is powered by eight AA batteries which provide around 20 hours of continuos use. Nicads can be used with no loss of performance. The battery compartment is separate from the electronics which eliminates the potential of damaging the detector in the unlikely event that the battery door O-ring leaks. While the elimination of nicads may seem like a step backwards, many times you will be water hunting in areas where you can not plug the unit in to recharge the batteries meaning your hunting has come to an end. Now, if your batteries run down, simply open the battery compartment, drop in a new set and youre back in business. Features such as this indicate that the Garrett team designed the Mark II to provide years of dependable operation. Another indication that Garrett Metal Detectors wants you to be successful with the Mark II is the instructional video that comes with the detector. It covers all of the adjustments and contains tips to get the most out of the detector in the shortest period of time. It always seems that I receive water detectors in the dead of winter and land units in the dead of summer to test. Well, the Mark II was no exception when the weather turned nasty just after the unit arrived. With temperatures in the mid-30s, I was not looking forward to getting into a wet suit and spending time in the chilly waters off the South Carolina coast. Driving to Charleston, SC, I headed to a few of my favorite beaches James Island, Kiawah Island and Edisto Island. Suiting up, I selected the Standard Trash Elimination mode and set the Elimination control at 0. Since the beaches had not been used by swimmers for more than 6 months, I decided to focus my efforts on searching the wet sand area as well as the shallow surf where a trough might hold valuables lost when the weather had been more conducive to frolicking in the water. In this search mode the Mark II responded to all targets the coil passed over; however, most of the typical ferrous targets such as bobby pins and berets had long since rusted away in the salt water. The detectors threshold did not waiver as I walked from the wet sand area into the surf up to the top of my chest which is a difficult transition area for most detectors. I was able to a find a trough at two of the three beaches I hunted which held a fair number of coins and other non-ferrous targets such as fishing sinkers, hotel room keys and even a few toy cars. Many of the targets had been two or three scoops deep (10-14 inches) and I had to give up on a few that were just too deep to recover with the waves moving me around. While no gold was found on this trip, I was able to find more coins that I thought I would find considering the beach had not been used for swimming since the previous summer. Returning home to Atlanta, I took the Mark II to a few beaches on Lake Allatoona. The lake level had been lowered for the winter and the beaches were all high-and-dry. Despite the fact that all of the beaches had been hunted for three or four months since the lake was lowered, I was confident that there were still some keepers to be found. Unfortunately the first two sites I tried turned up little more than a few pennies and some pull tabs. The last beach I went to was in an out-of-the-way cove and had not been hunted as heavily as the others. Starting with the Elimination control at 2 in the Discrete Trash Elimination mode, I adjusted the threshold control so that I heard a faint audio signal through the headphones. Searching toward the cables that marked the swimming area, I started to pick up several signals that turned out to be clad coins and pennies. Toward one end of the beach I found a number of pull tabs so I adjusted the Elimination control while sweeping over a tab. After rejecting the tab, I checked my wedding band and found that the gold ring still produced a signal. I continued hunting at this Elimination level and found additional clad coins along with several nickels. I was impressed by the fact that pull tabs were being rejected yet nickels which were lower in conductivity were still being detected. After two hours, I headed back to the truck with nearly $5 in coins and a 10 KT class ring in my pouch. Many of the targets had been down at the sand-clay interface (6 to 9 inches deep) and produced clear, repeatable signals. The Mark II is the first PI detector that can be used effectively in both salt and fresh water thanks to the unique discrimination circuit and two search modes developed by the Garrett engineering team. 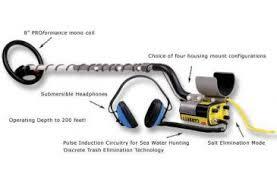 The Sea Hunter Mark II follows in the footsteps of its predecessor and provides water hunters with a quality metal detector that has been designed to provide years of service with features not found on other pulse detectors. With the innovative discrimination circuit found on the Mark II, one is able to not only ignore black sand and salt water typical of pulse induction units but much of the trash commonly encountered in popular sites such as swimming beaches. The Mark II comes complete with everything you need to configure the detector for beach hunting, wading or diving without the need to purchase any additional components. The only aspect you may want to look at changing is the use of bolts rather than spring clips in assembling the detector. I replaced two of the four bolts with spring clips which makes it easier to adjust the length of the shaft or collapse the unit for travel. Your Garrett dealer can provide you with the necessary spring clips if you want to do this. The Sea Hunter Mark II sells for $749 and comes with the standard 2-year factory warranty. For the name of your local dealer and a copy of Garretts informative buyers guide featuring its complete line of treasure hunting equipment, call the factory at (800) 527-4011, write them at 1881 W. State St., Garland, Texas 75042-6761 or visit their website at http://www.garrett.com.